Vive Harambee! | Creating opportunities for clean water and sanitation facilities to those in need around the globe. 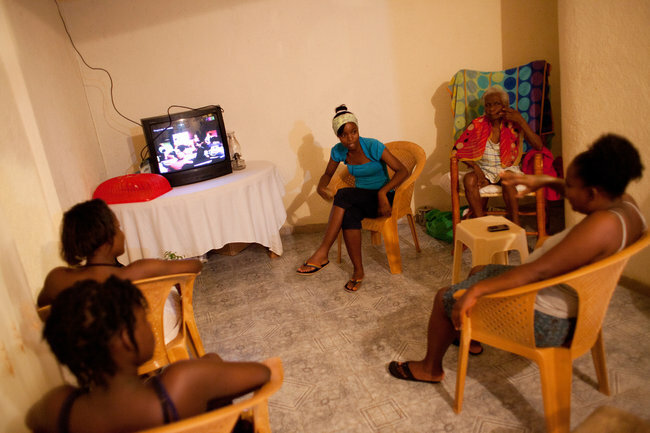 Manaelle Pierre, Mendije Sanon, Sarahie Thelasco, Yvone Hilaire and Ernst Clergé watch “Regards Croisés” at home in Pétionville, Haiti. make so many Haitians desperate to get out. Braving the heat, Fanilia Prospère took a break from pushing her wheelbarrow of imported used clothing to look around. Then she smiled. In Haiti, where so many promises of change turn to dust, the evolving landscape was worth the moment of contemplation: warehouse-sized factory shells rising from fertile soil, bulldozers rumbling distantly as they cleared farmland to build hundreds of homes and unemployed young men chattering under a mango tree about the change that was coming to Caracol. For the bucolic but impoverished fishing village on Haiti’s northern coast, the sight of foreign dollars creating new housing and jobs is filled with hope — and worry that the multi-million dollar investments also will spawn the all-too-familiar slums.